Long poly-diacetylene chains are excellent candidates for planar, on-surface synthesized molecular electronic wires. 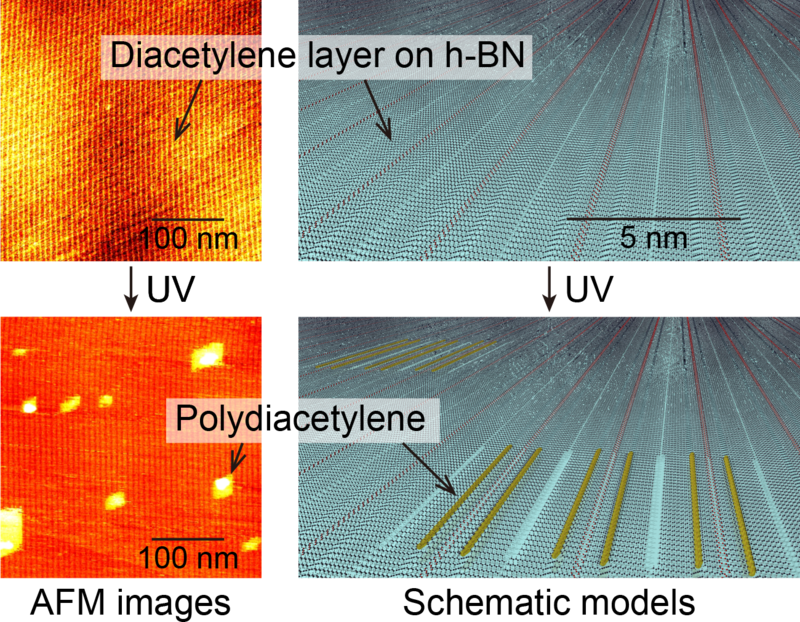 Since hexagonal-Boron Nitride (h-BN) was identified as the best available atomically flat insulator for the deposition of poly-diacetylene precursors, we demonstrate the polymerization patterns and rate on it under UV-light irradiation, with subsequent polymer identification by atomic force microscopy. The results on h-BN indicate self-sensitization which yields blocks comprised of several polymers, unlike on the well-studied graphite/diacetylene system, where the polymers are always isolated. In addition, the photo-polymerization proceeds at least 170 times faster on h-BN, where it also results in longer polymers. Both effects are explained by the h-BN bandgap, which is larger than the diacetylene electronic excitation energy, thus allowing the transfer of excess energy absorbed by polymerized wires to adjacent monomers, triggering their polymerization. This work sets the stage for conductance measurements of single molecular poly-diacetylene wires on h-BN.